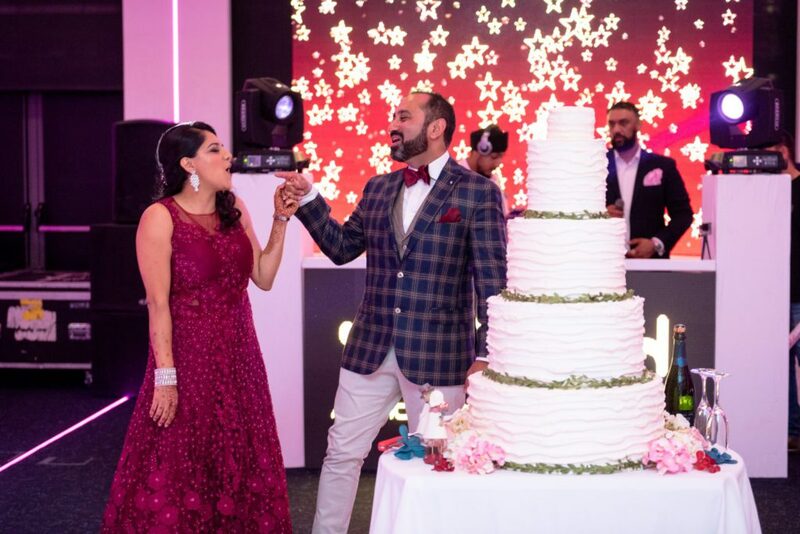 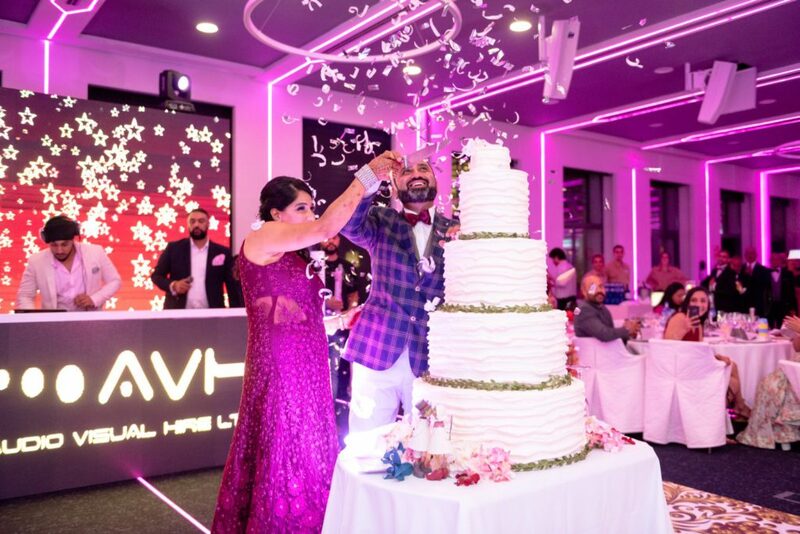 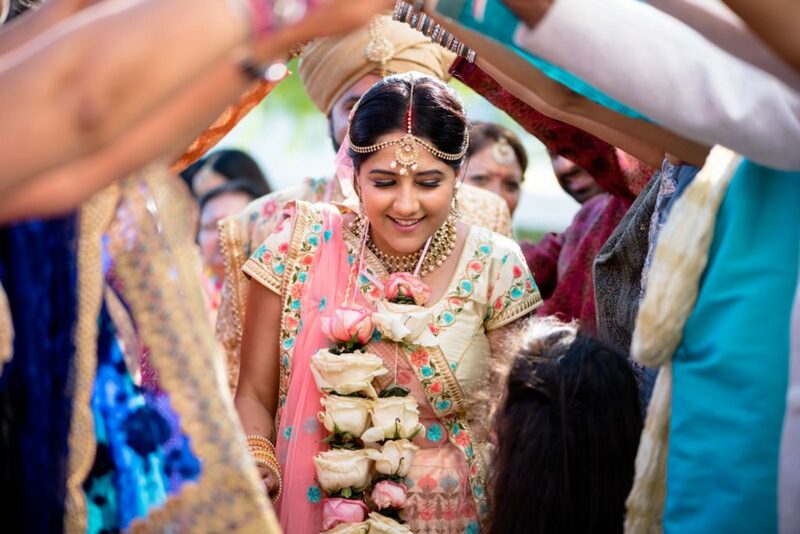 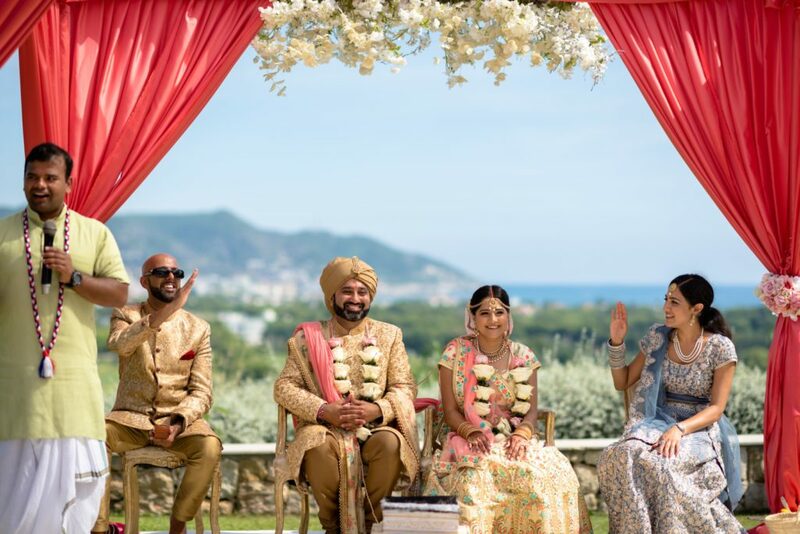 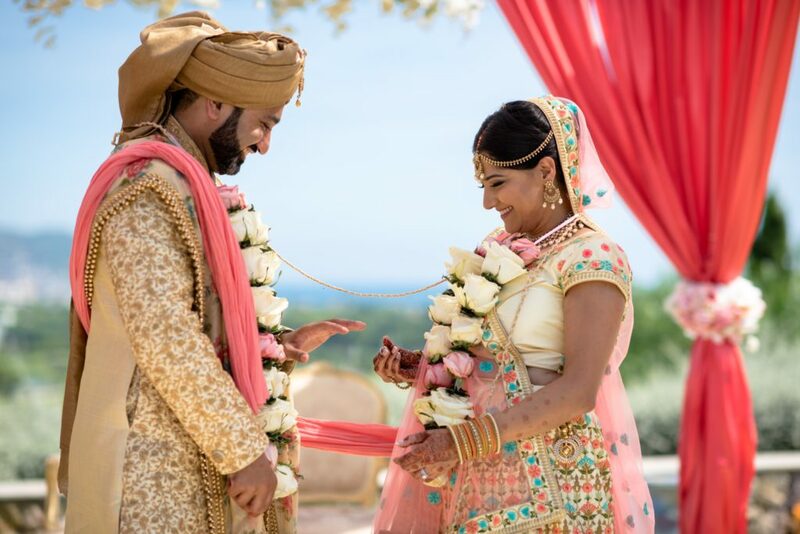 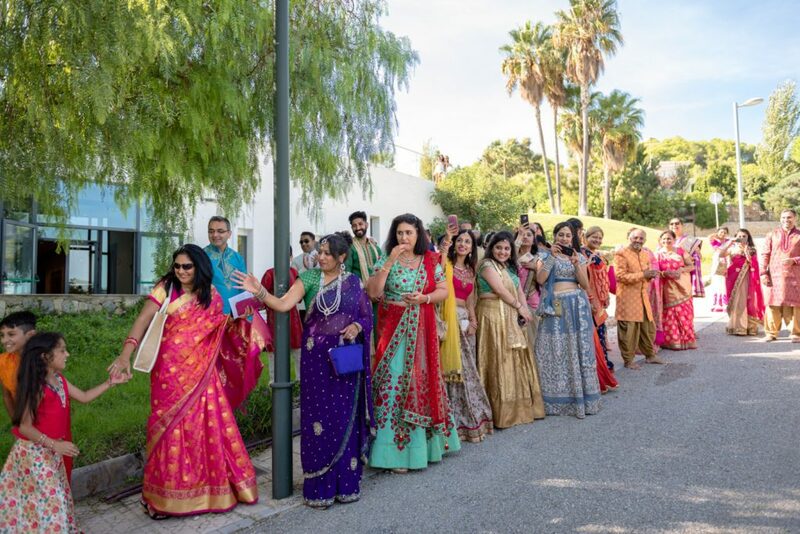 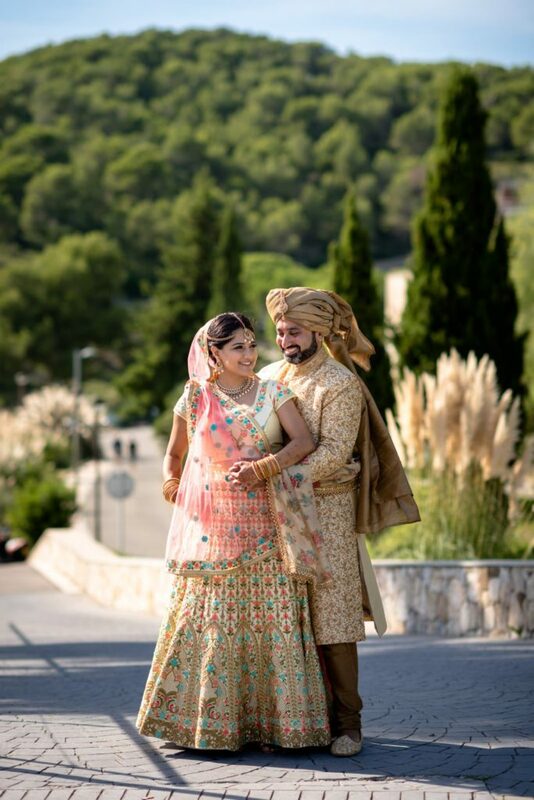 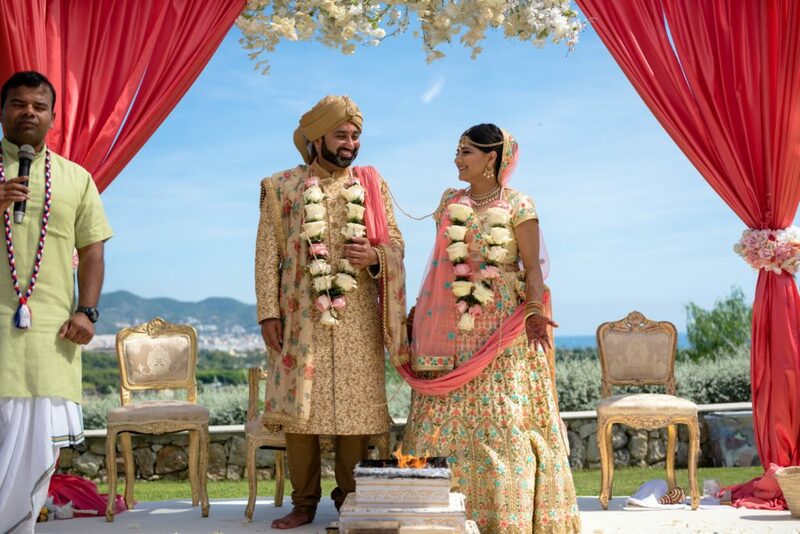 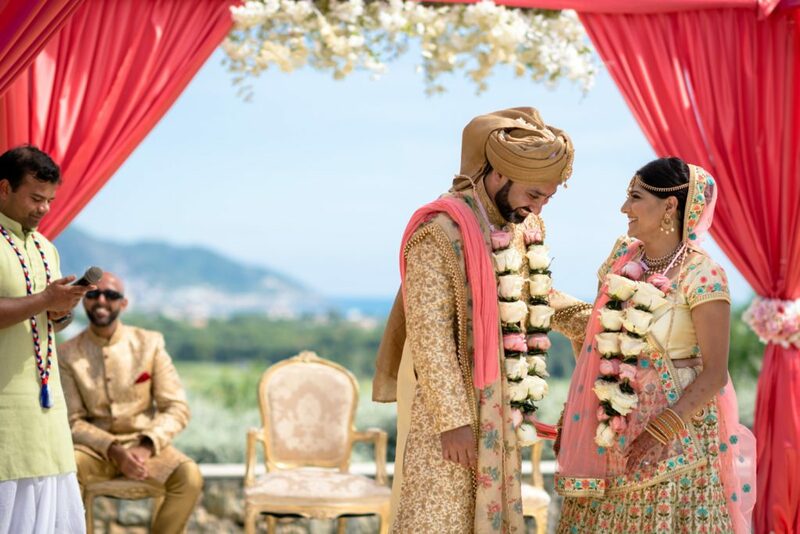 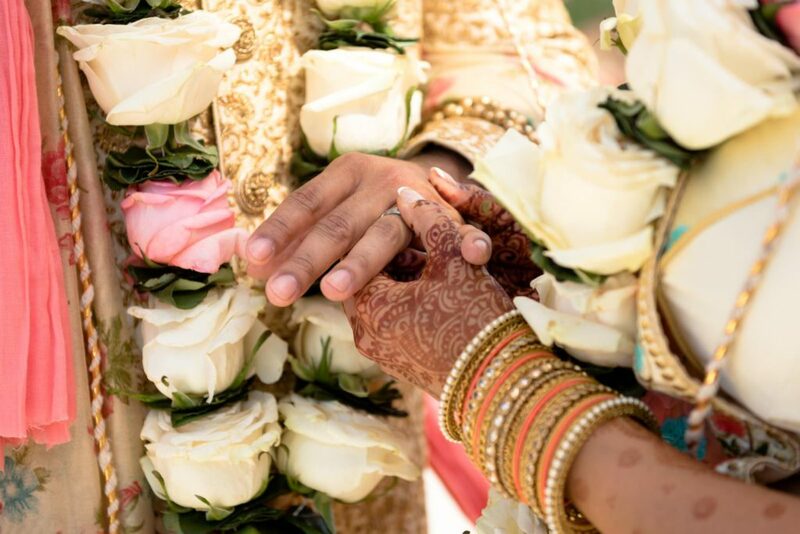 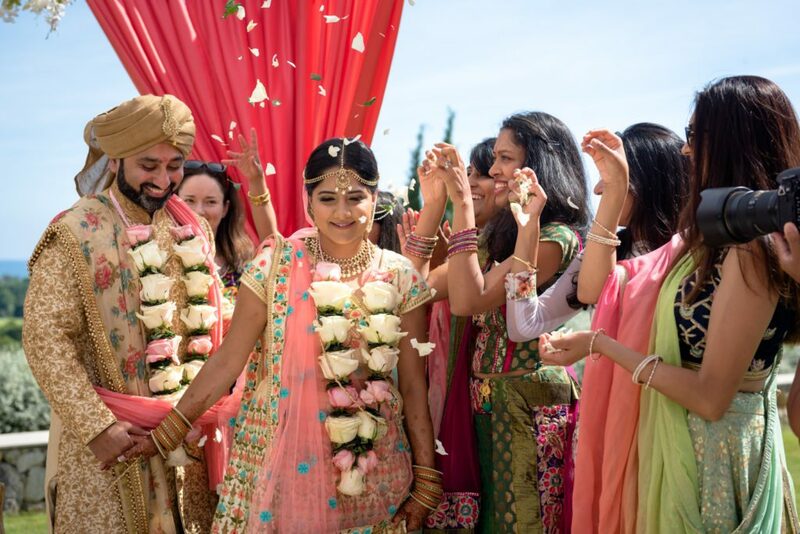 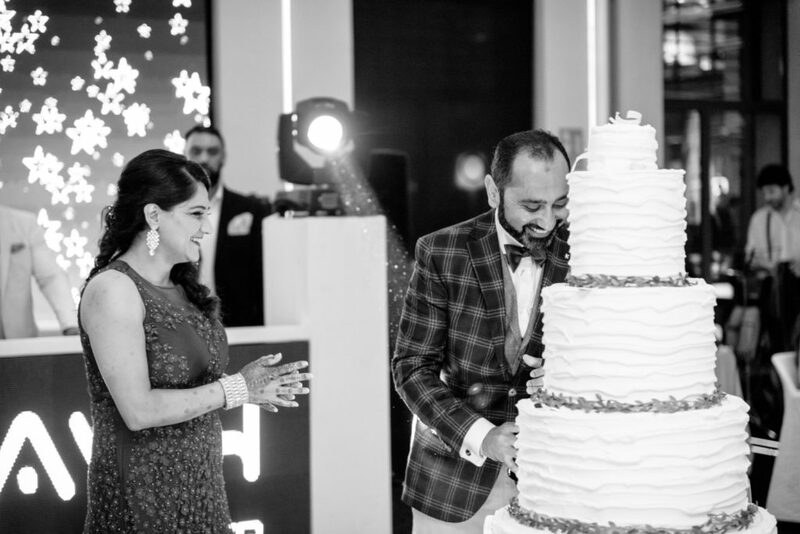 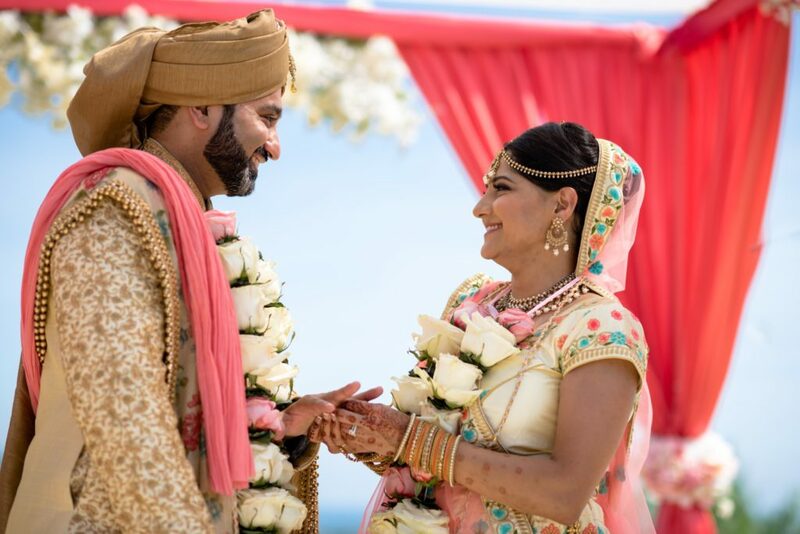 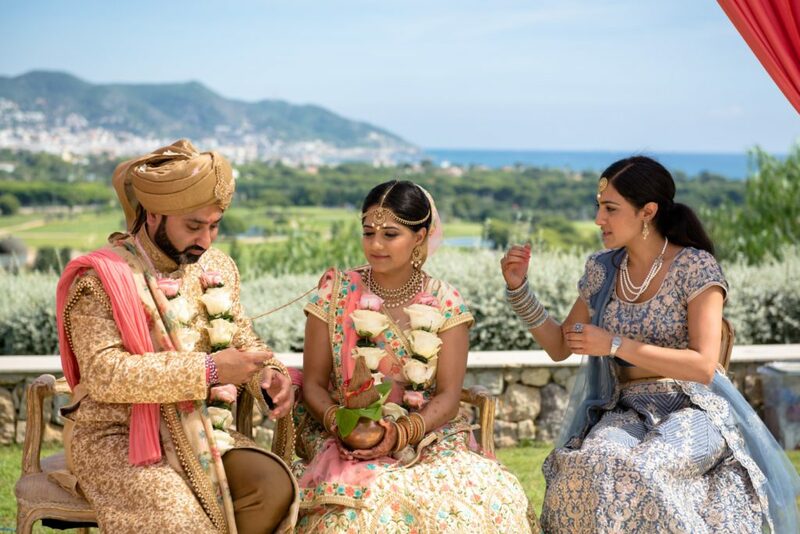 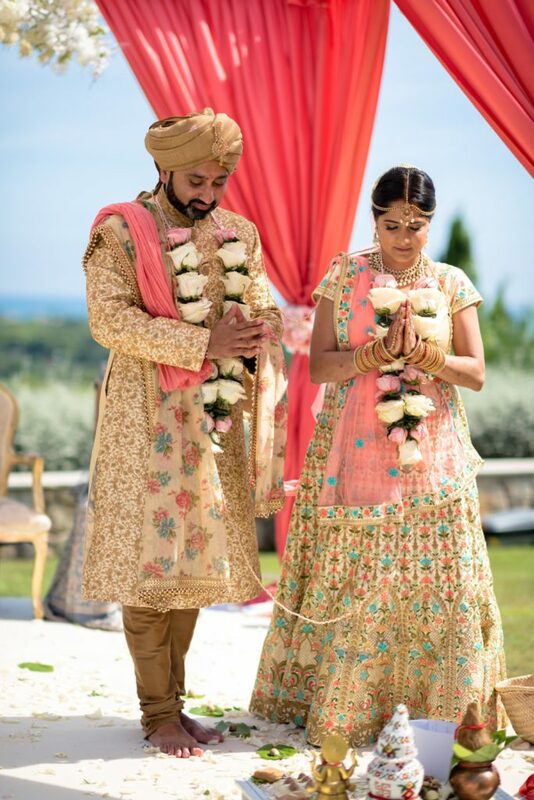 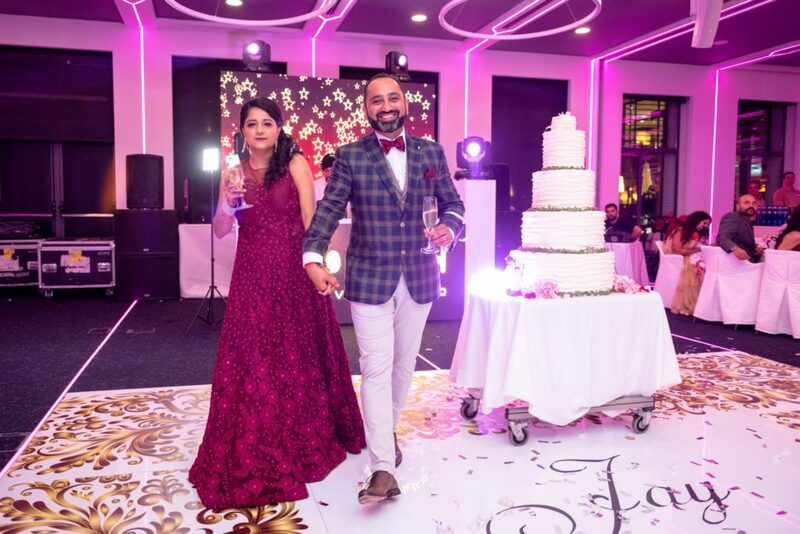 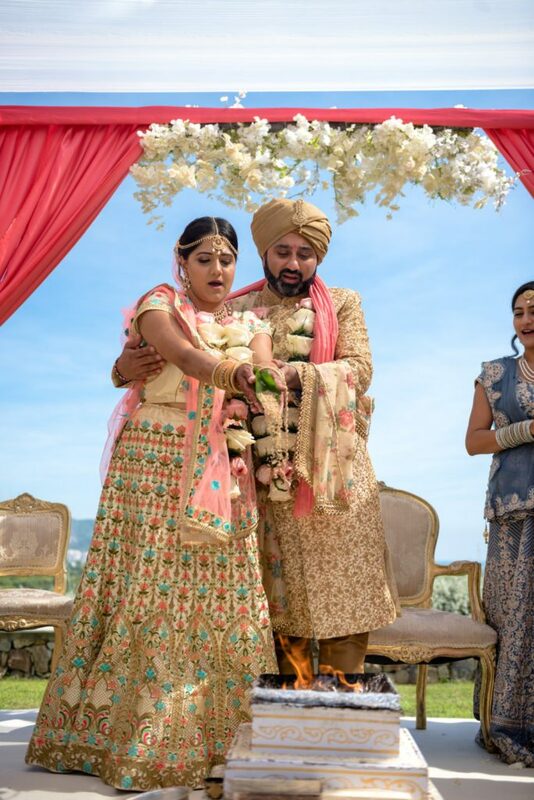 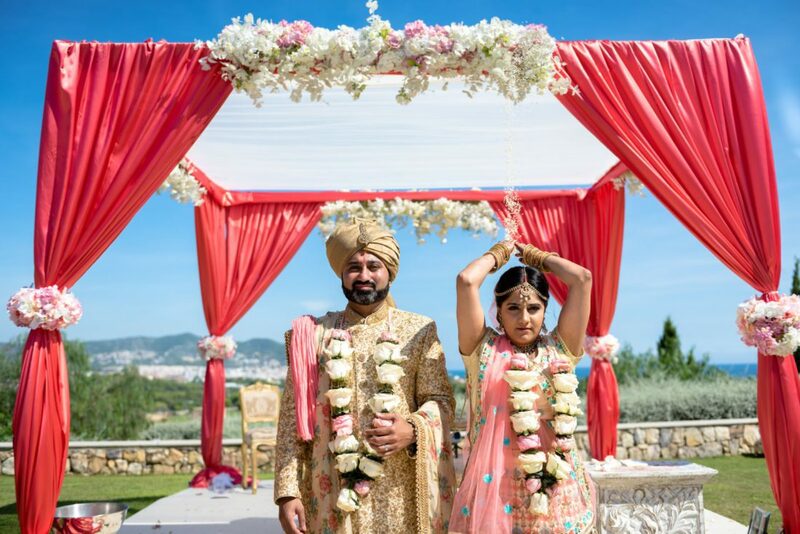 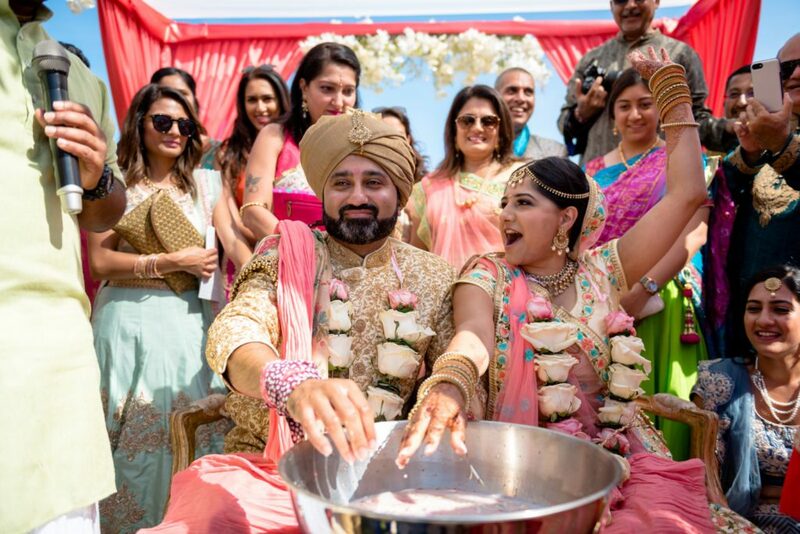 Tina and Jayant celebrated their Gujarati Indian Wedding in stunning Dolce Sitges. 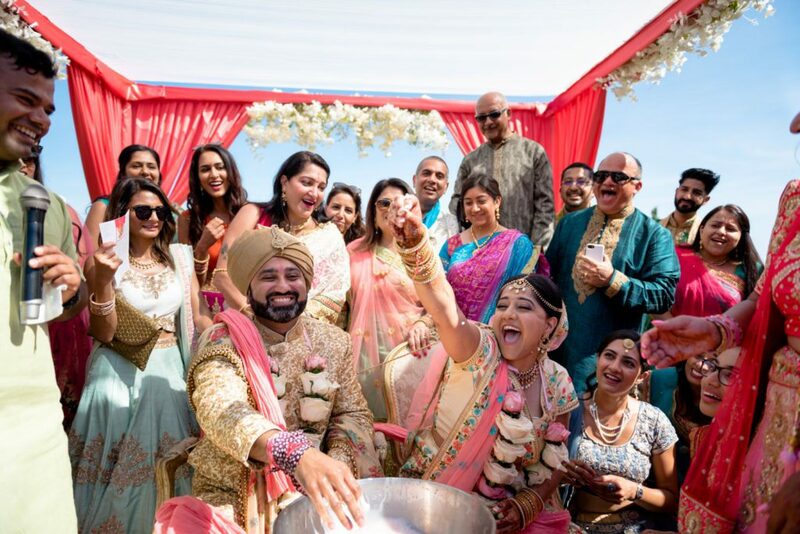 This venue has everything and is ideal for a larger Indian Wedding party. 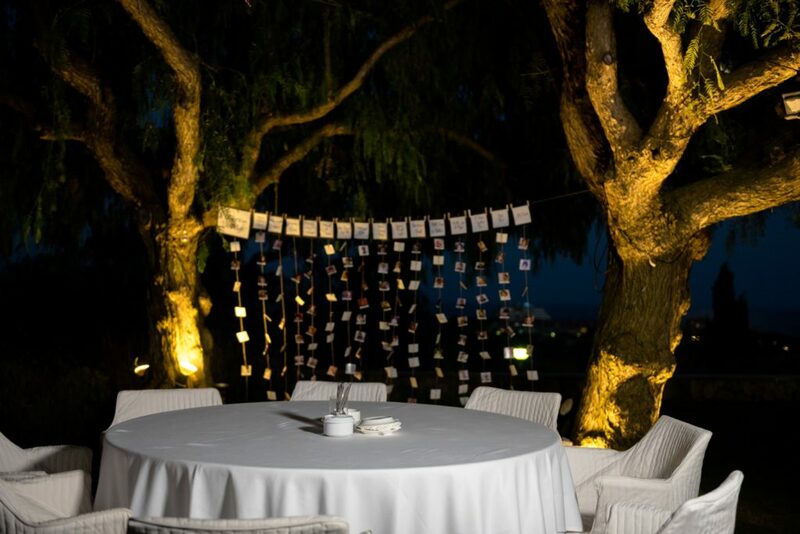 Unbeatable views which your guests will remember forever are just want of the pros of this stunning hotel. 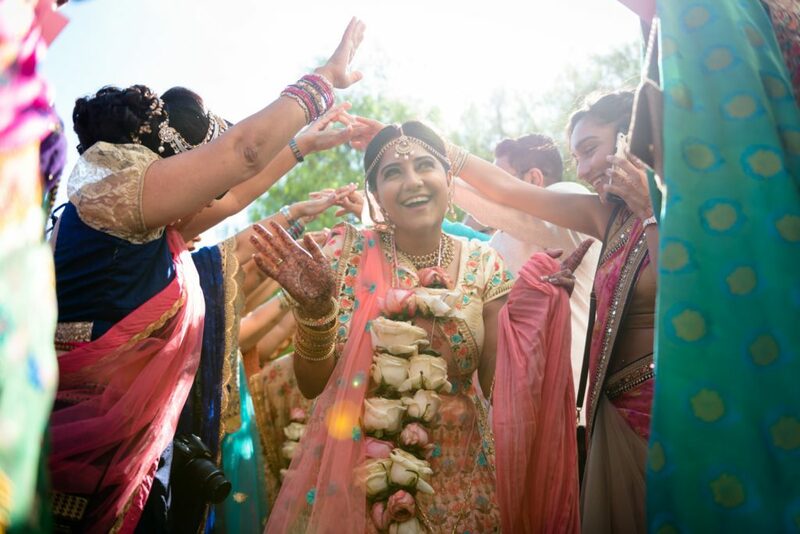 Not to mention spa, pool and room block discounts for wedding groups. 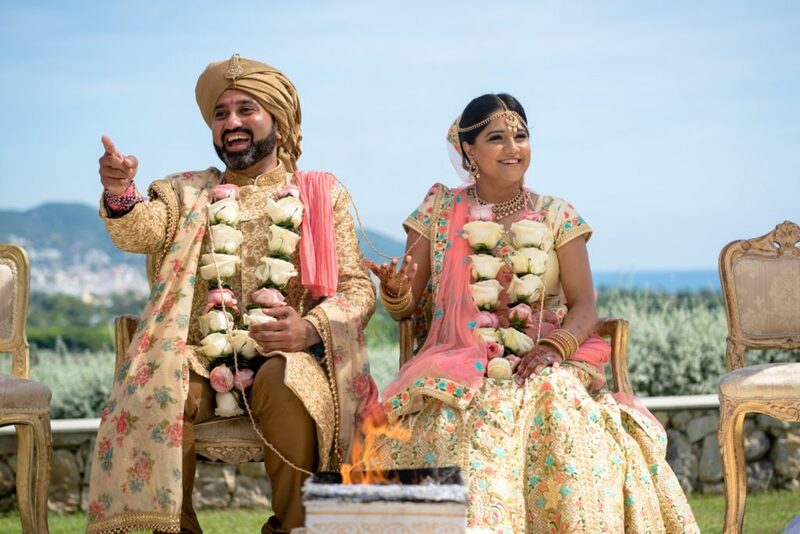 The are for the ceremony and reception are also completely separate to guest bedrooms so you can enjoy maximum privacy and intimacy while providing the ease and comfort of onsite accommodation for your wedding party. 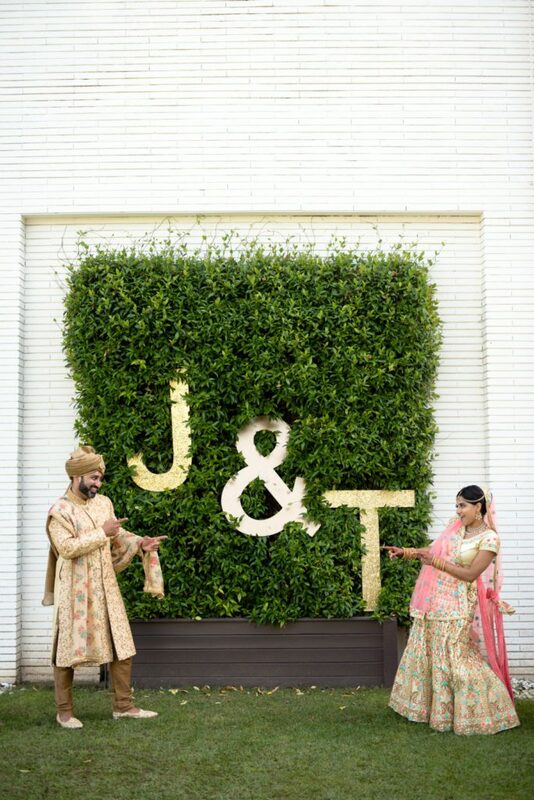 Tina and Jay knew from our first visit that this was the place they wanted wanted to hold their Indian Wedding. 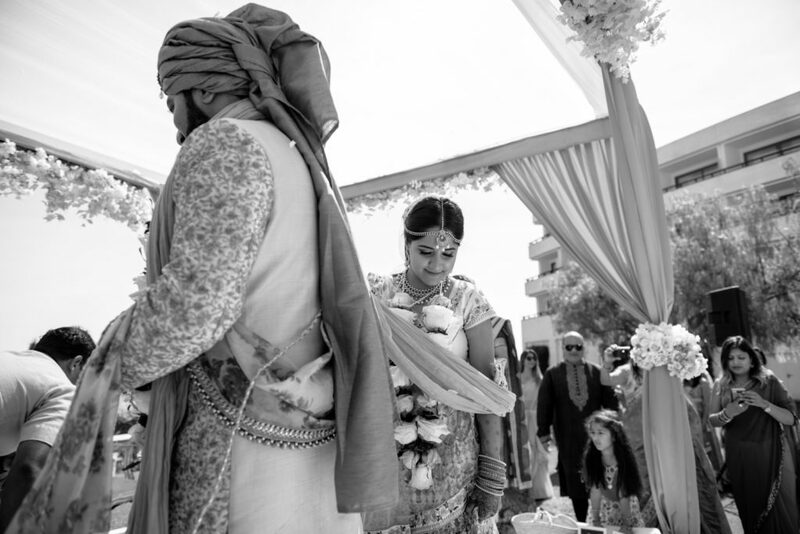 The couple brought their family priest from the UK and we made sure he had everything he needed. 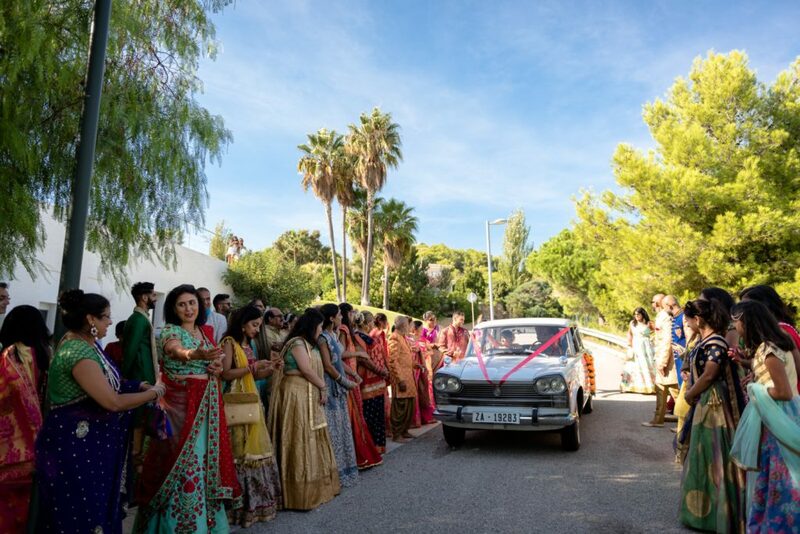 The ceremony lasted for over two hours and guests were captivated by colourful rituals and ceremonies, all with the backdrop of the Mediterranean sea and Garraf mountains. 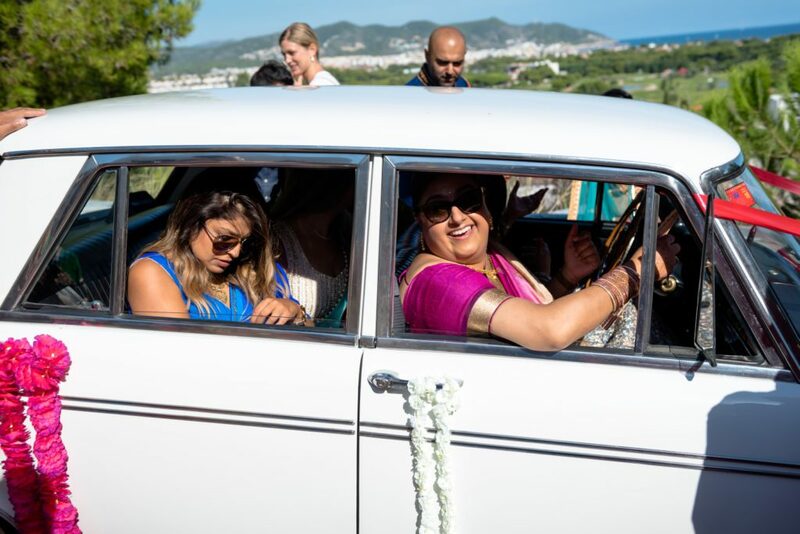 Their Barat came in the shape of a vintage Barcelona SEAT car decorated by Barcelona Brides with colourful theme decoration. 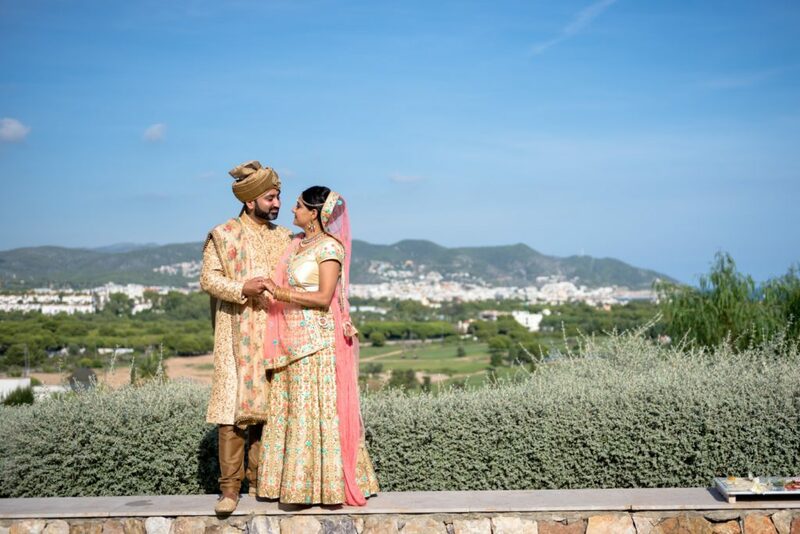 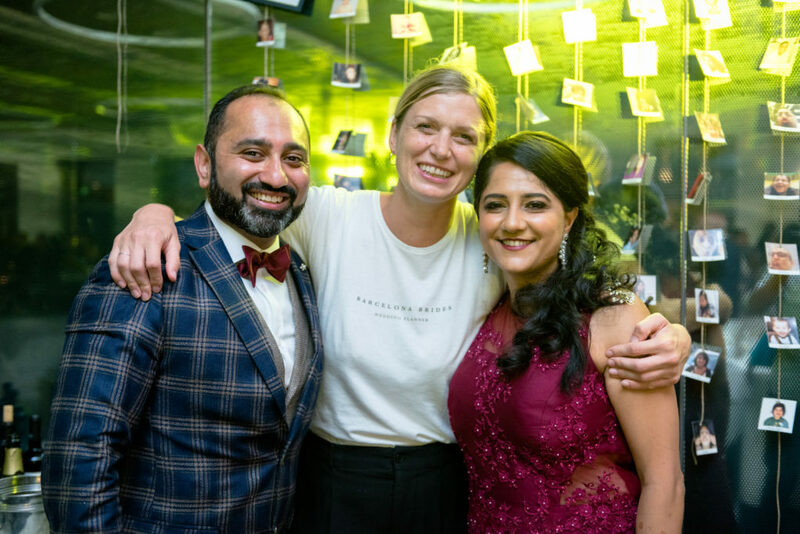 Tina and Jay wanted to make sure they incorporated both Catalan and Indian wedding traditions and I think they did with flying colours. 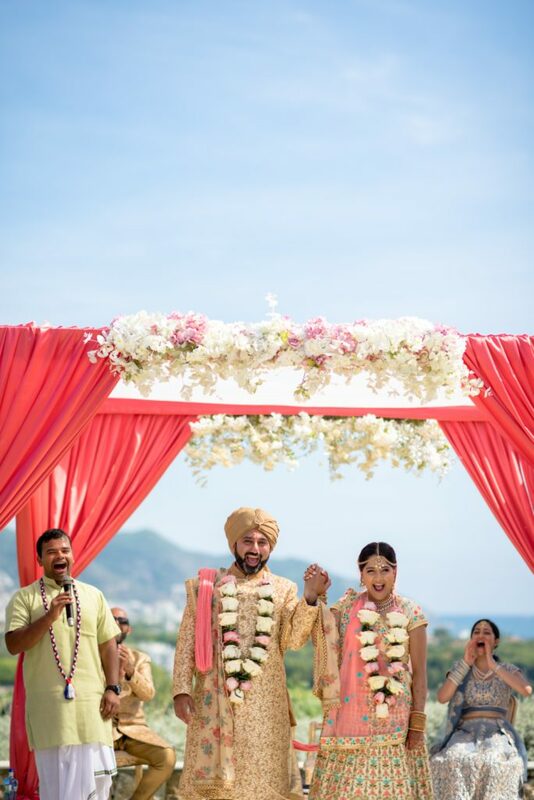 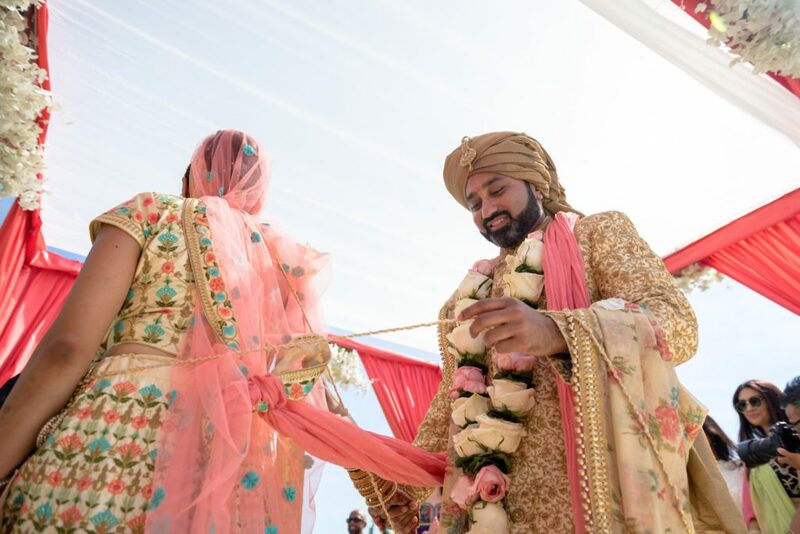 Their stunning wedding attire matched with the mandap and the soft pink, white and coral tones of the florals. 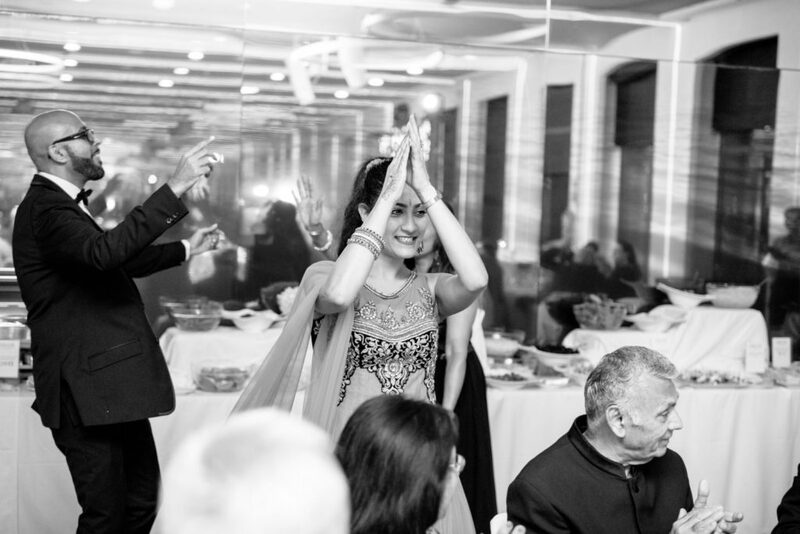 Ganesh was also present in all his glory. 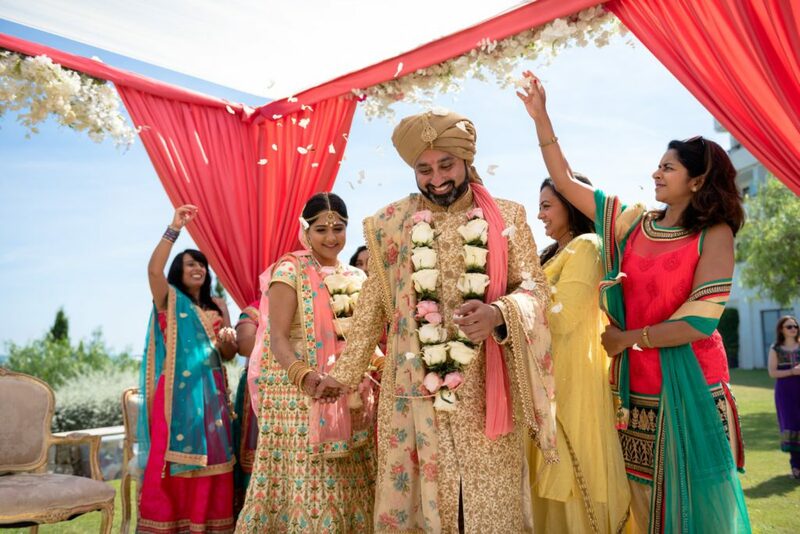 Our Gujarati groom wore a Dhoti and Kurta, and to complete he wore a matching turban embellished with precious stones. 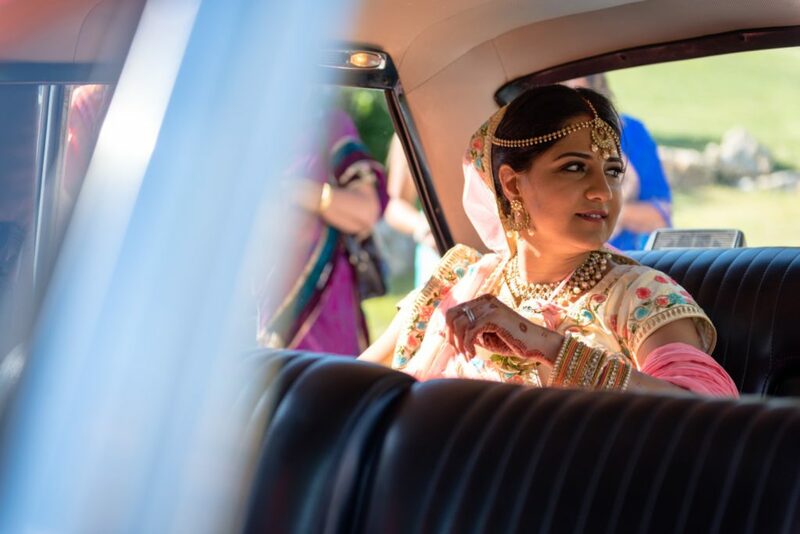 our beautiful Gujarati bride wore a traditional saree Garchola sourced in the UK. 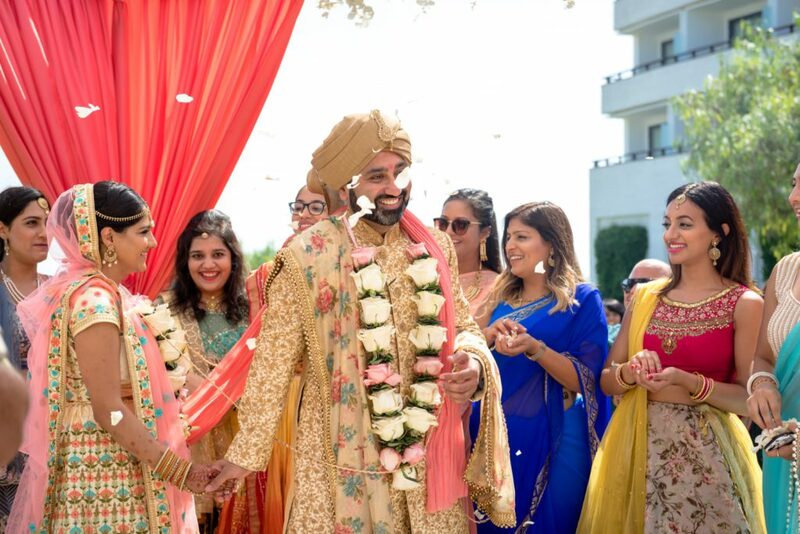 As you can see the attire of both guests and bridal party were luxurious and colourful. 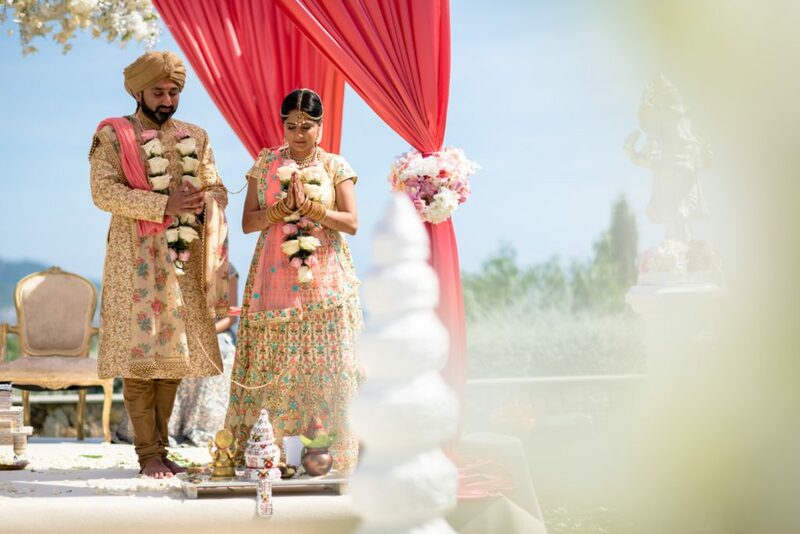 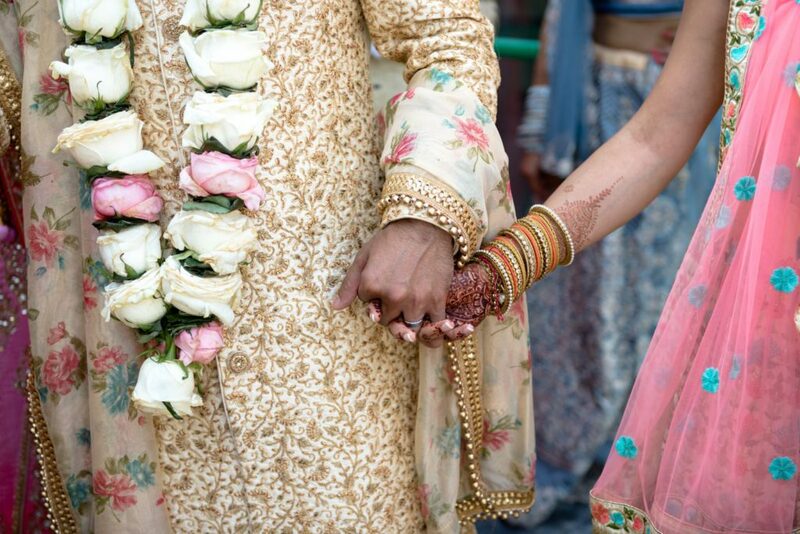 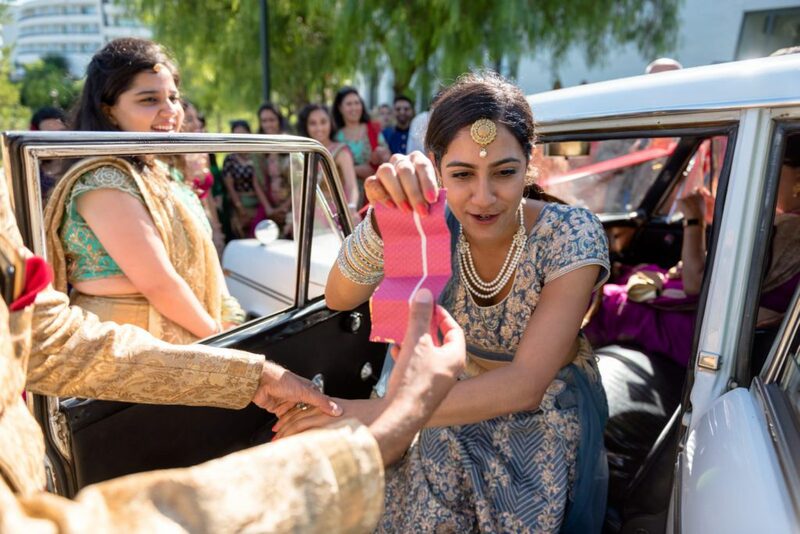 The light filled images of all three days of this Indian wedding were taken by Ed Pereira. 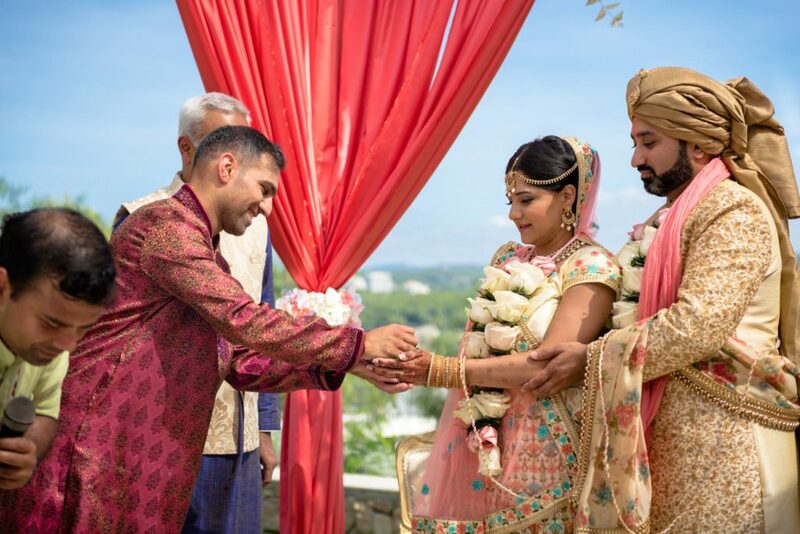 He is an excepcional professional who fulfilled all of our couple’s expectations. 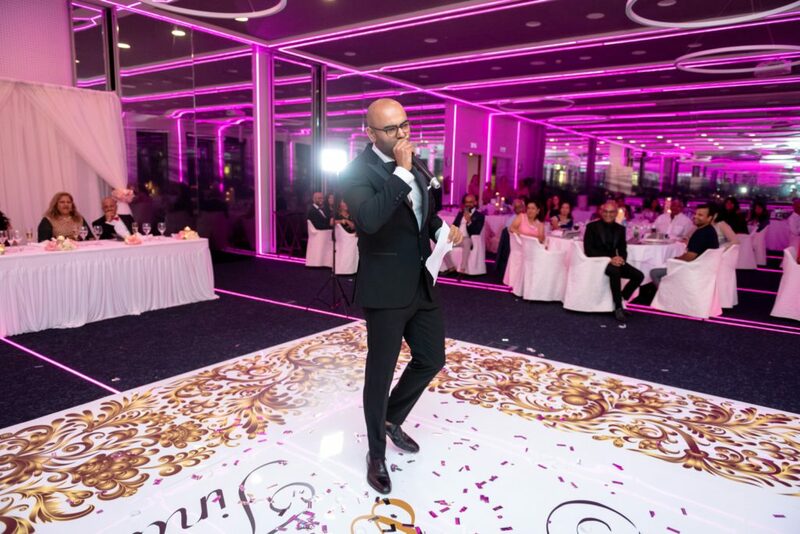 We can’t wait to work with him again in 2019. 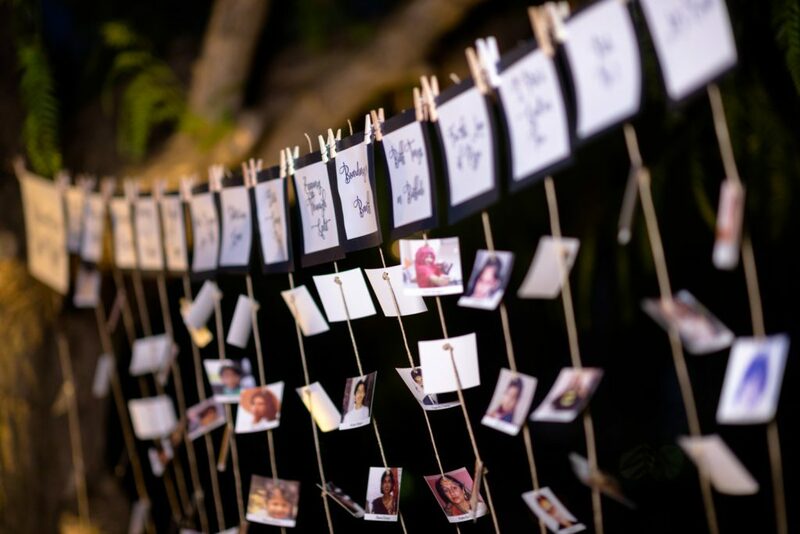 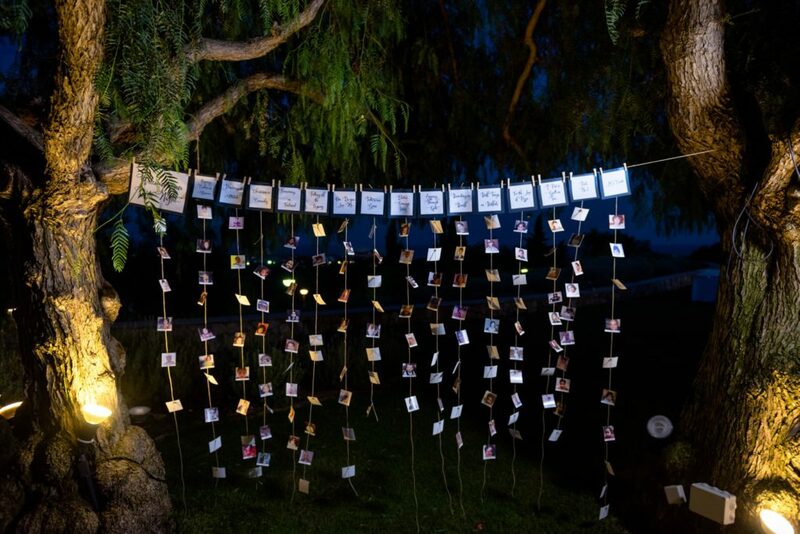 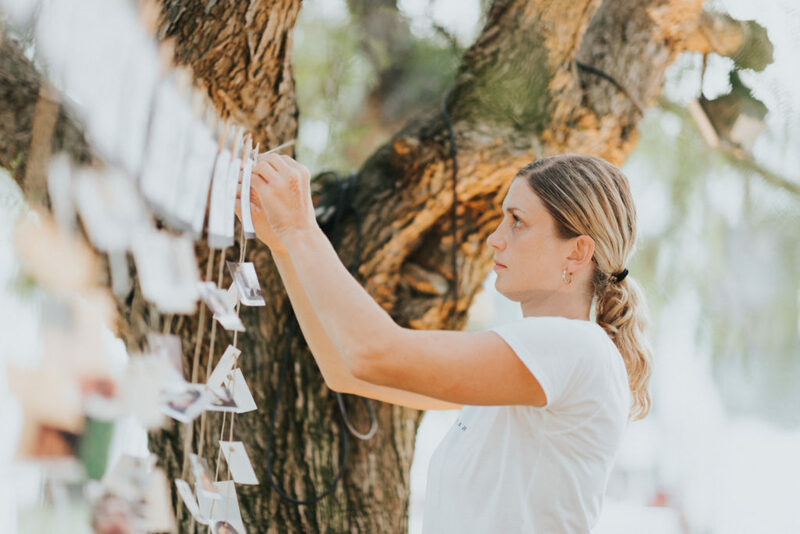 The seating plan was our bride’s idea, all of their favourite “date nights” complete with a little photo of each and every guest as a child. 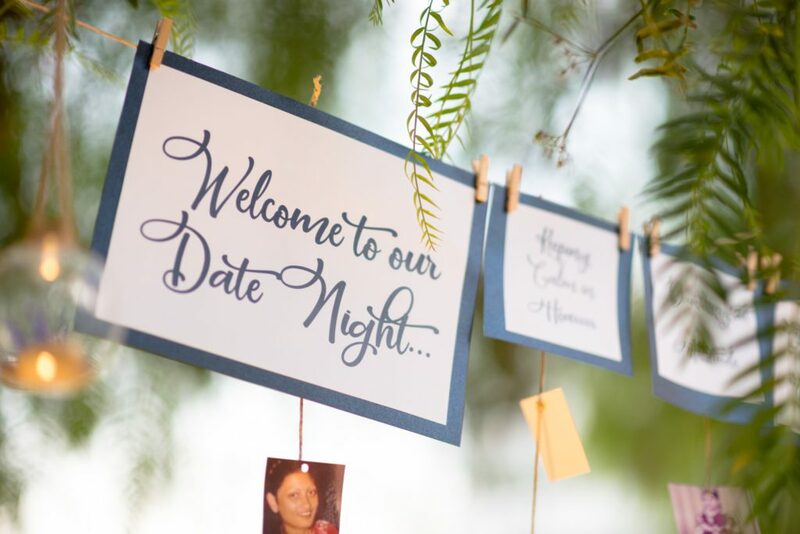 This was personalised decor to the max and we loved it. 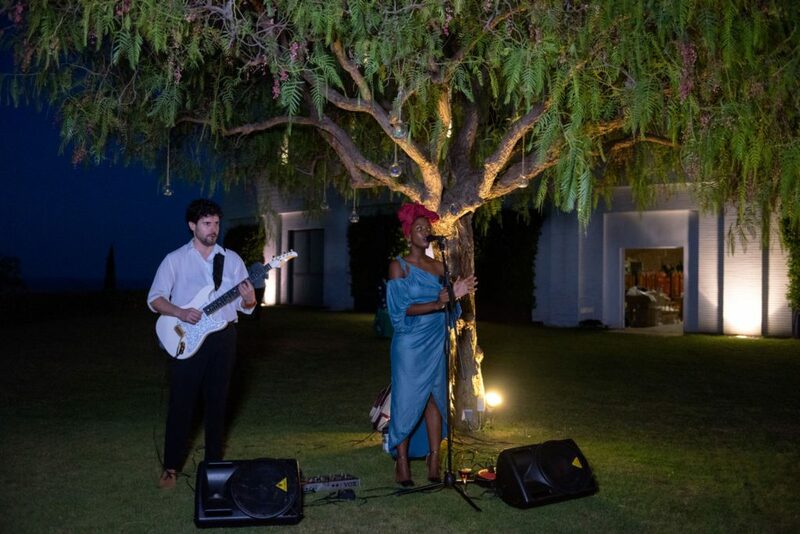 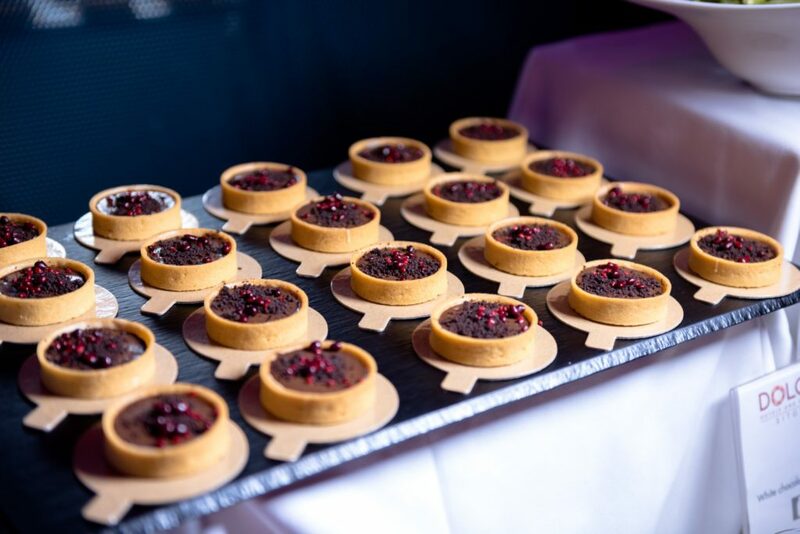 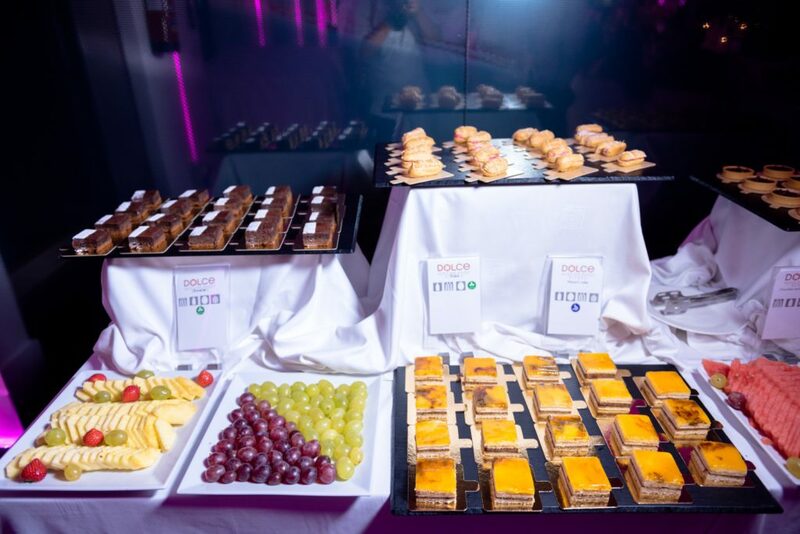 The catering was also amazing as you can see, guests enjoyed an evening reception with music by Tina and Joe and music, dancing and a massive cake which lasted until the very early hours. 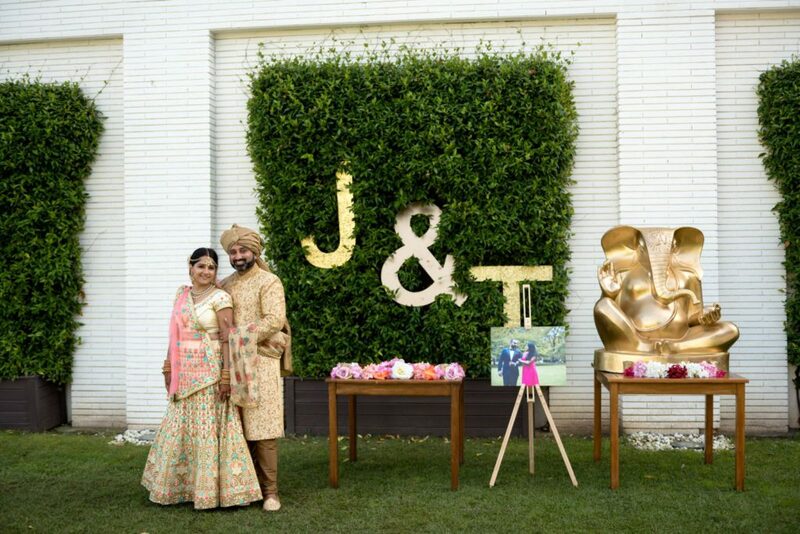 Congratulations Tina and Jay, we wish you so much happiness.